A student may request or be requested to take a leave of absence from the seminary for the duration of a semester or longer. In order for this leave of absence to have the official status of “leave of absence” the seminary and the student must have assumed clearly specified responsibilities toward one another. (See below). a variety of reasons; it may be personal, spiritual, intellectual, and/or pastoral in nature. Because it is a specified program of the seminary, it is considered by the seminary to be a positive and integral part of a the candidate’s preparation for the reception of Holy Orders. Hence, a student who officially takes a leave of absence, and who is already a candidate for Orders, maintains his status as a candidate as long as he complies with the stated terms of the leave; moreover, because a student on an official leave of absence is still considered in formation for Holy Orders at St. John’s Seminary, he is subject to the ordinary rules for dismissal or change of status. A Leave of Absence is coordinated by the Director of Formation. A contract is created indicating the goals to be accomplished during the Leave. The following points are to be specified in a written contract signed by the student, the Rector, and the Formation Advisor. What is the purpose of the leave? What does the seminarian hope to achieve by it? How does the seminarian plan on achieving his purpose? How does he plan on using his time during the period of the leave? What is the duration of the leave? How shall the leave be terminated or extended? a. What form (written or oral interview, etc.) will this accountability take? b. Who is to represent the student as Formation Advisor? Towards the end of his leave, the seminarian will send to the Rector his own evaluation of how well he has achieved his purpose for taking a leave and how well he lived up to the conditions of the leave, i.e., did he follow through on the plans which he set out in the original agreement, did he remain sufficiently accountable to the seminary? The seminarian will also indicate those individuals with whom he worked who can give an evaluation of him during his leave. 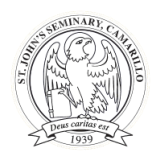 The seminary, at its own discretion, is free to contact the individuals and to question them about the seminarian and his activities and work during his leave of absence. A man may come to the decision to leave the seminary for a variety of reasons. It is important that this be carefully discerned and that his leave-taking is done with respect for his privacy. The attitude of the community needs to be that this man is following God’s will in this decision. His Vocation Director / Director of Seminarians. He should submit a letter for his file indicating the date of his withdrawal and forwarding address. He should check with the business office regarding any debts he may have, e.g. financial aid, student fees, book bills. If he needs to continue insurance coverage through the seminary for a limited period of time (e.g., summer) he may make this request to the Rector or business office. Payment would be his responsibility. If he is enrolled in field education or arrangements have been made for the following semester, he must notify the Director of Field Education so that the placement may be cancelled. If he needs transcripts, he may request these from the academic office. Typically faculty are notified prior to his leaving; he may share the information with anyone else at his discretion. A formal notification from the Rector’s office is posted after he has left, simply stating that he has withdrawn and the effective date. Typically a blessing is given to the man as a formal leave-taking from the seminary. This is done at a liturgical function on his last day at the seminary. He will be asked if he would like this ritual to take place.